Why am I having so many issues with this java thingy!?! Still won't d/l or recognise any update even after removal and restart and I've still got 2 Java icons in my start menu thingy! Worst of it is I focking hate coffee!!! Don't worry, it is just a sign you should give up on Azureus and go with uTorrent instead. The main reason being that uTorrent doesnt need Java, is a smaller installation that takes less resources. The downside of uTorrent is the lack of a blue frog logotype. Serious flaw, granted, but I believe you will still be ok.
As far as I know uTorrent also supports UPnP so why not give it a go? Oh, and an update on the Java issue. Unistalled all found references, even restarted my PC, attempted d/l of new update and... it doesn't work. Marvellous. 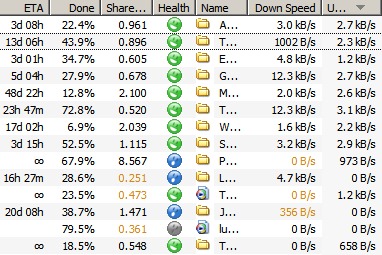 So now I have an under-performing uTorrent, an apparent complete lack of ability to even download Azureus and no Java. Yay. Last edited by AntRobertson; 05-01-2007 at 11:32 PM. Finally got father Ted working in the VLC player. And how many times have we recommended VLC....? Probably not. You probably chose a poorly supported torrent to download. Nearly everyone on ADSL in Thailand doesn't have their ports forwarded and it works fine. Try choosing a better supported torrent to download first before giving up with it. I ought to make a few house calls on my trip in March. I will even provide free diet coke Surasak. I've noticed that Limewire is fairly poor right now also - only getting about 20-40kb/s (cf. usual 50-100kb/s) - but I've put that down to generally crappy Internet lately. Presumably everyone is experiencing this at the moment? Something to do with a cable and that earthquake in Taiwan I believe? Possibly also monkeys. Monkeys are always invovled, somehow, somewhere... Damned monkeys! would be there by now if you had left it on. The whole series of father Ted came down at an excruciating speed. 5 kb/s, but I have it now (after a week). Bear in mind you used to have to wait a week for a new episode in the uk on the telly. Don't know what factors are involved. Besides, you must have better things to do than watch the download Ant. that's not so bad. would be there by now if you had left it on. The whole series of father Ted came down at an excruciating speed. 5 kb/s, but I have it now (after a week). You've got to be kidding me!?! Not so bad!?! Flippin 'eck guv'nor, seriously don't think I'll bother now, that is excruciatingly slow, testicles against cheese-grater slow. When the internet and everything is ok I can get full movies off of Limewire in a couple of hours! Heck I downloaded episodes 1-6 of the current season of Lost in only 7. Given all the apparent headaches just downloading and setting up these torrent things it's barely worth the effort :? I got lost really fast too, but for whatever reason some are quicker than others. BTW, the reason I shifted over to torrents was that my ISP (maxnet tt&t has blocked all P2Ps including limewire), don't be surprised when you get blocked. Best to make your contingencies now. stick with it Ant. I'm enjoying your strife. I'm confused... actually going to have a crack at this port-forwarding on uTorrent shortly (Azurerus is out, can't so much as download it let alone run it) so if you don't hear from me you'll know it has been a catastrophic failure and I've focked me Internet. I agree, the key is to leave stuff running - note that you dont have to do only one at a time. If you just keep things going all the time you will soon have more to watch then you have time for. 8 kB/s isnt so bad really. Some will be faster and some slower, and during the course of download, a lot can happen too. If the right person latches on, you may soon find the speed triples or quadruples. They're like kettles on a stove, if you watch them they never seem to finish, but if you just leave them alone they're fine. Even with my router forwarded properly at times uTorrent thinks it hasn't been setup for forwarding. It really shouldn't affect download speeds much. Yeah sure, I do that with Limewire also. But the difference is - just for one example - I'll get home from work, start some downloads, piss around for few hours (dinner etc), come back and they're done. Then I'll pop the files on me PSP to watch in bed whilst the Mrs watches some crappy soap. I appreciate what you're saying but I honestly wouldn't/don't have the paitence for that. Silly I know but on that basis I don't think I'll bother. The two main things I use Limewire for are readily avaliable (Lost and Entourage) so probably not any point going to torrents unless they can at least match the speed of Limewire. you have obviously had a bad experience. Some torrents start off slow, then suddenly click into gear. My experience is that torrents are overall quicker than p2p, you certainly have more choice. Music can be downloaded in albums rather than just the singles that you get on limewire. 8kb/s is unusual indeed for a new movie. How long did you keep the download on? 8kb/s is unusual indeed for a new movie. How long did you keep the download on? Crickey that's it, made up me mind... sticking with Limewire. 100k bytes / second not good enough? Any fans of "24" might like to know that the first six episodes of the new series have been leaked onto the net. Understandably, "Fox" is a bit pissed off about this as they dont even start to show them themselves for another week. Available at all your favourite torrent search engines. Bloody Nora! What speed link have you got? I can't believe you don't know Marmers. It's that dreadful shite with Kiefer Sutherland saving the world in a downbeat style. Co-incidentally, he has now done this 6 times in exactly 24 hours.